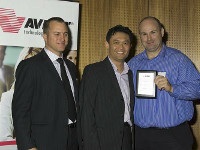 December, 2007 – Melbourne, Australia – Gamma Solutions Pty Ltd has been named, Avnet Specialist Partner of the Year 2007. This award was presented to Gamma Solutions National Sales Manager, Paul Pleming at an awards presentation in Sydney Australia. Gamma Solutions won the Specialist Partner of the Year at the recent Avnet Technology Solutions A1 awards evening. The Specialist Partner of the Year is awarded to the top performing partner by revenue, who exemplifies a specialist sales approach, selling specialised technology such as mobility, storage or security products via Avnet.